For a map and directions suitable for printing click here. You will need Adobe Reader to view and print the material. This walk is intended to familiarize people with the column stream crossings that will be encountered throughout the Sugarland Run Stream Valley Park region. 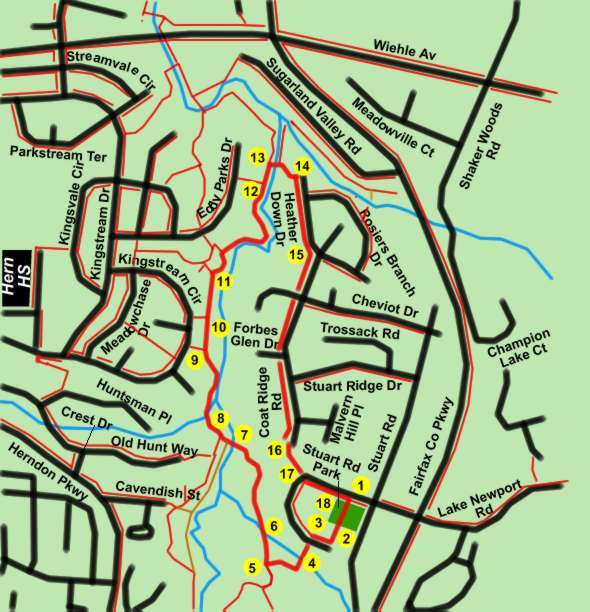 The surroundings on this walk are quite similar to Reston and the trails are identical except for the stream crossings. Persons with a poor sense of balance may not wish to attempt these crossings. The crossings are not intended to accommodate baby strollers. The walk starts from the parking lot in Stuart Road Park. Stuart Road Park is in Reston on Lake Newport Road just west of Stuart Road and the Fairfax County Parkway. Some parking is available in the park and street parking is available. From the parking lot take the asphalt trail away from the road with the basketball court on the left and the playground area on the right. The trail intersects with the end of Lake Newport Road. Turn right and follow the sidewalk for about 2 house lengths. Turn left and take the asphalt path between the houses on the other side of the street. The trail crosses a stream and turns right to follow the stream. The trail ends at another asphalt trail. Turn right. The trail crosses the stream on columns. Continue on the trail. The trail crosses Sugarland Run on columns. You have now left Reston. At the next asphalt trail intersection turn right. You will shortly cross a bridge over another stream. At the next trail intersection the trail appears to turn to the left. Take the asphalt trail to the right to continue following the stream. Continue straight past the next asphalt trail intersection from the left so that you remain along the stream. An asphalt trail intersects from the left. Go straight on the present trail. Very shortly a large stone crossing appears on the right. Turn right to make the crossing over Sugarland Run. On the other side of the stream take the asphalt trail to the right up the hill. The trail emerges between the homes onto Heather Down Drive. Turn right and follow the sidewalk for one block. Turn right at Coat Ridge Road and follow the sidewalk for several blocks to the end of this road. An asphalt trail appears at the end of the road. This is a Reston trail. Follow the trail for a short distance to Lake Newport Road. Turn left and follow the sidewalk on the opposite side of Lake Newport Road. After walking up hill for less than a block the entrance to Stuart Road Park appears on the right concluding the walk.